Yes Bank (यस बैंक) is the India's 5th largest full service commercial private sector bank and the only bank that got the 'Greenfield bank License' award from RBI. The bank operates multiple businesses like Investment Banking, Branch Banking, Financial Markets, corporate banking, the wealth management business across the country. Like other corporate private sector banks, YES BANK also provides multiple facilities to its customers to inquire his/her account balance instantly. So, if you are an account holder of this bank and for many reasons, if you feel an urgency to know your exact balance, the bank will offer you multiple options in front of you to inquire your exact balance in your account. Like other banks, YES BANK also has missed call banking facility that helps you to know your exact account balance instantly. To get the benefit of this service, you have to register under this system by sending an SMS to "YESREG <Cust ID>" only from your mobile number which is registered to the bank database to +91-9840909000. When the registration is completed, you are ready to get the benefits of this Missed Call Banking. Now, give a missed call to 09223920000 and get your information. Give missed call to number 09223921111 to get mini statement via sms. If you want to get all information about your account balance at your fingerprints, then take the advantage of the cutting-edge technology of SMS Banking by only registering to (+91-9840909000) by sending sms 'YESREG <Cust ID>'. After completing the registration process, type "YESBAL <Cust ID>" and send it to +91-9840909000 for current account balance enquiry. To get mini statement, type"YESTXN <Cust ID>" and send it to same number +91-9840909000. By using YES BANK USSD channel you can also verify your account balance. For that dial *99*66# to initiate bank's USSD session, now select the desired menu and enter the last 4 digits of your account number and MPIN to receive your account information. Dial *99*66*1# for Balance Inquiry and *99*66*2# for Mini Statement from registered mobile number. For balance inquiry, you may also contact to the Toll-Free Number at 18002000 to get your account balance information. To take the benefits of this service, first of all, download the UPI App and then link your account and check your account status. Hope this article will be very helpful to get instant information about your Yes bank account balance. 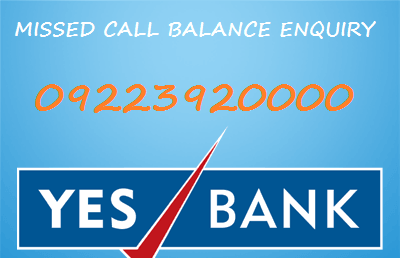 How to register mobile number in yes bank for balance enquiry?